Gamasutra: James Buckle's Blog - Is Early Access Worth It? Is Early Access Worth It? It’s getting near time I released Captain Kaon, it’s been five months in Early Access and it’s nearly done. I’m taking it to Rezzed next week, then I’ll come back and do the last things that need doing and pop it out the door. Now seems like a good opportunity to look back on how my Early Access release went. For the most part I wouldn’t call it a success, but as long as you learn lessons from your failures you’re on the road to turning them into successes. In the case of Captain Kaon I’ve had to wonder how much of what went wrong was down to my failings and how much is because Early Access games don’t sell much anymore. Bar a few popular exceptions, is Early Access dead for the average indie developer? It’s difficult to plan for something you haven’t done before, it’s hard to know what to expect. This is why I’m writing this, to pass on what little I’ve learnt. I spoke to other Indies in the Brighton community to get a few tips and this gave me my first worrying signs that Early Access isn’t that great any more. None of them had much in the way of positives to say about it. I looked at my Early Access release as having 3 main goals. Firstly, I was burning through my savings at too high a rate and needed to finally have an income to slow this down. Secondly, I wanted to get some player feedback to identify any issues in the game that I’d missed. Thirdly, I wanted to get the game out there generating interest, spreading word of mouth and hopefully catching the attention of the press. Getting exposure was something I had struggled with during Greenlight, I hoped that people would engage more with the game once they could get it in their hands. Really not well. The sales goal came up short. I had hoped to ship around 100 units a month, this wouldn’t have generated much but it would have helped. In the 4 months that Captain Kaon has been in Early Access 25,566 users have visited my store page and the game sold a total of 47 units, with 655 people wishlisting it. This means only 0.18% of visitors bought the game. I have no point of reference to determine if this conversion rate is average or low, but it was hard not to see this as a worrying indicator of how well it will likely sell on final release. At that rate I would need 9 million visitors to break even. I had a PR guy speaking to the press and it got little bits of coverage and I even did my first podcast, but the feedback I got from him was that the press aren’t that interested in covering an Early Access release. Perhaps, as with Greenlight, the lack of press interest is a sign of the lack of player interest. The initial signs as I head in to Rezzed are an increase in press interested, but not at a great degree, I’m hopeful that this will be reflected in player interest. What coverage I did get was all good, but it was hard to tell what effect it was having on sales. The analytics would sometimes show a bump in page views, but often it was hard to discern any difference. When there were large spikes in the page views, this rarely translated into a spike in sales. After the initially sales spike on the first week, which came from being in the new releases list, the background sales were a fairly steady 2-3 a week. The player feedback went a little better, there were several threads on my community page and they were really helpful for identifying areas to prioritise. There wasn’t a lot of feedback, but what little I got was invaluable. The usage stats Steam provided were also useful. It was clear that people weren’t just playing my game for 5 minutes, nor were they playing for just long enough to get the trading cards and then stopping. Players typically play for between 3 and 5 hours, which is great. Unfortunately, after 5 hours the number of players goes off a cliff, which was not so great, and an indicator that there is some kind of block they hit at that point that stops them from continuing. Again, data like this is invaluable, it’s pointed me at an area of the game that I’ve got wrong and have been able to work on and improve. The final goal, getting the game out there and trying to get noticed, is a little harder to evaluate. There’s no easy metric for it. Looking at my Google analytics, the visitors to my store page has been on a general downward curve. It seems to have bottomed out over the last month at around 60-70 visitors to the page a day. The question is, is my Early Access performance the norm? Is it like this for everyone or have I made a bad game. What little press I’ve received and Steam reviews I’ve garnered have all been positive, but that doesn’t mean there isn’t something fundamentally wrong with the game. I’ve been aware for some time that Captain Kaon’s concept is not all that appealing; it doesn’t exactly jump off the page and demand you buy it. I suspect this is the root of my problems with Early Access as it was with Greenlight. That there is more going on than simply people being unwilling to buy an Early Access game. And then the scammers crawled out of the woodwork. Once the game was released I started getting a lot of e-mails, in some respects this meant I was achieving goal 3. There were suddenly half a dozen people a day asking for Steam keys for review. Typically they were YouTubers or from Steam groups, but occasionally they were journalists from a press website. Initially this was exciting, then it started to become a bit suspicious and I had to stop handing out keys. A couple of things had happened, my Google Alerts had pointed me to a page selling Steam keys for Captain Kaon and I got an e-mail from someone cheekily asking for 3-4 keys for him and his friends. It was clear that scammers be scamming, and it’s been going on for several years now. I like to think there’s a special pit in hell for people who would try to scam a £5 key from a broke indie developer. On advice from my PR guy I became a bit more wary of whom I gave keys to and started doing a few basic checks. Does the e-mail come from the domain name they claim to represent? If they give you a link to a website but are operating from a Gmail address that’s been made to look like a genuine address, you’ve got a scammer. It will be something like [email protected] Although it should be noted that several legitimate journalists (usually freelancers) I’ve been in contact with have used hot mail addresses, in these cases the e-mail wasn’t trying to be something it wasn’t. You can also Google their name and find articles they’ve written. Is the e-mail correctly formatted, does it have a footer, site logo, does it look like a professional person sent you this e-mail? The scammers just send you a quick e-mail, usually one sentence, often poorly worded. ‘Can I haz key pleeze?’ They don’t really care how they present themselves to you, they just want a key and then they’ll be off. These e-mails are all the more obvious when you visit the You Tube channel they purport to be from and find the real person is a fluent English speaker, but the e-mail has such terrible grammar that it’s clearly from someone who isn’t. One way to challenge these people is to point them to your YouTube page and ask them to send you a message, they can only do that if they are the actual person. Sometimes you get a nice surprise and they actually message you. After a couple of days of this I prepared a stock reply and just started copy/pasting it into replies. Does the YouTuber actually play indie games? When you get sent a link to a channel and all you can see is the latest triple-A shooter….well….if you’re the real person why are you asking for a key to a game you’re not going to play? If you’re a scammer you’ve picked a really poor disguise. And then something cool happened. There was the odd cool e-mail, one of which came from Indiegogo with an offer to add Captain Kaon into one of their bundles. As the game wasn’t selling all that well it seemed like a good way to gain exposure and increase my player base. I looked at any potential financial gains as a bonus, which was good because it only got me £500. 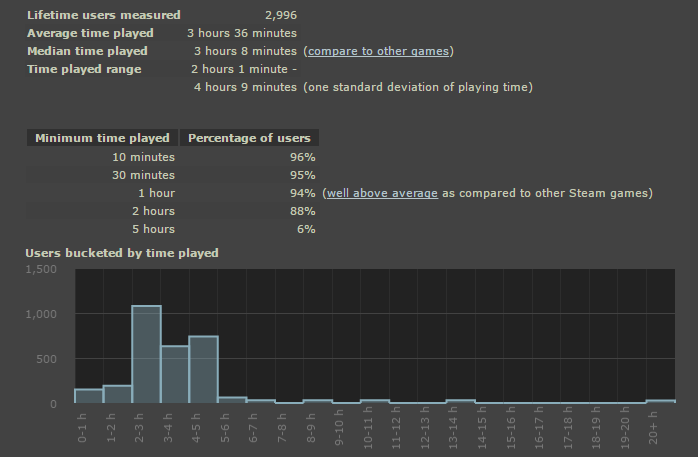 Exposure is hard to measure, but I’m up to 5000 players now, which was useful for generating the Steam usage stats. Unfortunate it wasn’t that great for getting direct feedback in terms of community feedback and Steam reviews. Most of the comments I got were asking for Trading Cards, it was clear that these players weren’t really invested in the game itself. I guess that to the consumer Trading Cards are a big part of what these bundle deals are about. In response to the requests for cards I spent a couple of weeks generating all the art assets they required. In the end it was completely worth it, there was a sudden and dramatic effect on my player numbers as soon as I added them and made an announcement post. Before adding the cards I had 0-2 players a day, once the cards went in this leapt up to 200. Slowly over the week it dwindled down and settled at around 10-20 a day. So it would seem that an important rule of indie games is ‘always add Trading Cards’. Is Early Access worth doing on my next game (if I’m lucky enough to do one)? It’s hard to say. What little research I’ve been able to do through Steamspy indicates that sales aren’t great generally and that 3D/multiplayer games seemed to be favoured. Looking at games released around the same time as Captain Kaon, my sales are at the lower end compared to them, but so too are the other handful of 2D games released at that time. The successful games are the ones of a popular genre, generally first person games. Niche games seem to struggle. I also wondered if it was a question of reputation and fan base, as this is my first game I have neither. It’s certainly true that the more successful Early Access games come from developers and publishers who have released before. But at the same time, Endless Space 2 is backed by SEGA and has only sold around 60k units. I certainly think it’s important to establish trust and good will with players to be successful. If I deliver a good game in Captain Kaon, perhaps people will be willing to take the risk and buy my next project.